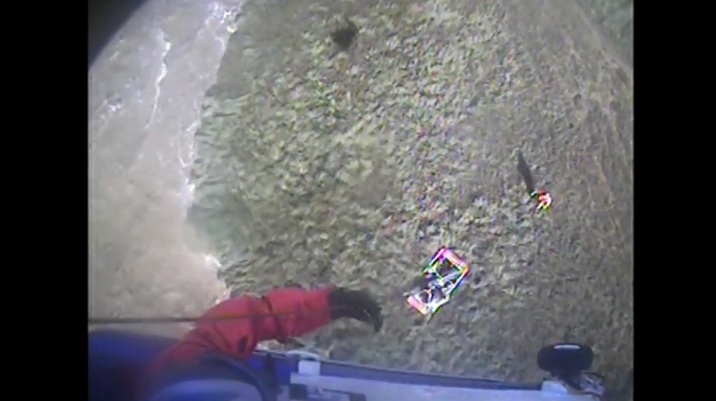 HOUSTON — The Coast Guard rescued three hunters and their dog after their vessel overturned near Freeport, Texas, Saturday afternoon. Sector Houston-Galveston watchstanders received a call from the wife of one of the stranded men reporting that her husband and two others had fallen overboard near Bastrop Bayou. The men were able to right the vessel but were unable to start the engine. An Air Station Houston MH-65 Dolphin helicopter aircrew arrived on the scene, hoisted the three men and their dog, and transferred them to Gulf Coast Regional Airport where they were met by awaiting family members. There were no reported injuries to the men or their canine companion.